Mario Laplante's "traditional" contribution to the portfolio is untitled. Digital printing seems to have a different register of experience. Its method of capturing is simple and the printing even simpler. In contrast to more traditional printmaking techniques, digital printing appears effortless. A digitally printed surface is not unlike the sound of a CD when compared to the audio experience of a vinyl record. It is like pushing an off or on button as opposed to delicately depositing a needle into a groove. Digital printing offers the many options, but, at this time, the end result does not live up to the rich seductive layer of ink embedded in the paper of a traditional print. The two prints Ive included in the portfolio began with the construction of tangible objects made of found printed material. Both prints took on the shape of two concentric circles, one very thick and dimensional and the other as thin as a sheet of paper. 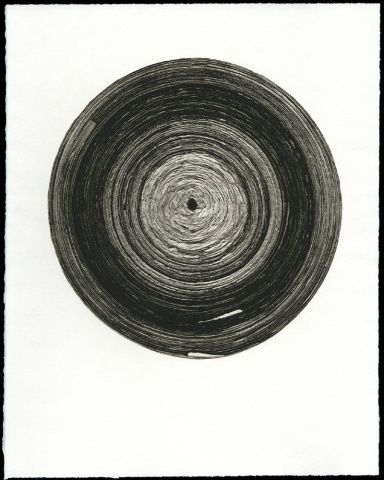 The first circle, printed traditionally, was made by laboriously rolling very narrow strips of paper torn from old discarded hand printed lithographs. The roll was photographed with a now obsolete tool, a copy camera. From the silver base negative exposed by the camera, a film positive was developed. The film was then used to expose a polymer plate. The polymer plate was wiped intaglio. The second circle, printed digitally, was made from old pages of vintage magazines. The collage was scanned using an Epson Perfection 3200 scanner then printed in full color using an Epson Stylus Photo 2200.